Protect yourself from payment fraud and identity theft! 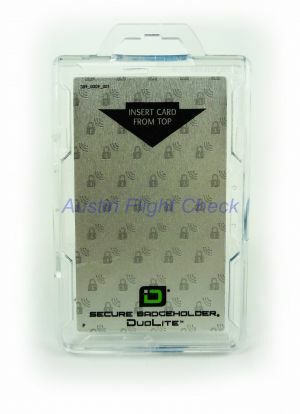 The Secure Badgeholder DuoLite holds and shields either one or two cards. One side of the badgeholder allows the card to be inserted and removed from the top. The other side allows the card to be inserted and removed from the side. You do not have to completely remove the card from the holder in order for it to be read. Simply by sliding the card about halfway out, you can easily present the card to the reader with one hand, which won't slow down throughput in PACS. See the Secure Badgeholder Duolite product animation below. Our Secure Badgeholders are made of extremely durable polycarbonate. The state of the art unique open face design keeps cards locked in to prevent loss, yet allows easy access to remove them when necessary. Other holders on the market cover the face of the card, keeping debris and liquid trapped inside which can damage the card. Closed holders also make removing the card for reading and displaying difficult. The perfect choice for TWIC, HSPD-12 PIV, CAC, HID iClass, LincPass and other RFID enabled cards. Don't risk identity theft, invasion of privacy, tracking, or even card cloning. Always keep your contactless cards in a shielded Secure Badgeholder. Open face design won't cause abrasion to the card and trap in dirt and liquids like other holders. For a more in depth paper on what makes Identity Stronghold Secure Badgeholders the best available please click here. You can be sure you are protected when you use Identity Stronghold RFID blocking products. Discover more about our pilot supplies here! See the full story from Fox News on how identity theft takes place by scanning RFID-equipped cards.